string(1193) "Events > News & Analysis > Announcing a New Collaboration Using Tech to Combat Human Trafficking"
The RESPECT founding organizations, Babson College’s Initiative on Human Trafficking and Modern Slavery, the Global Initiative Against Transnational Organized Crime, and the International Organization for Migration, proudly announce that we have been chosen as the Research Lead to guide the Tech Against Trafficking (TAT) initiative. We are looking forward to leveraging the full potential of technology to help eradicate human trafficking. A growing number of organizations and initiatives are working to tackle the scourge of forced labor and human trafficking, which affects 40 million or more people around the globe. Given the widespread nature of this crime and the complexity of tackling it — further evidenced in the 2018 U.S. State Department’s Trafficking in Person Report, published today — the increased engagement from all stakeholders, including and especially the private sector, is vital. 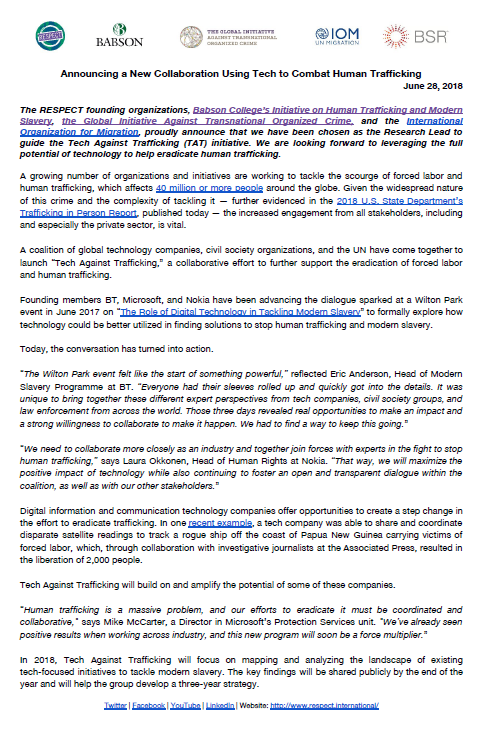 Founding members BT, Microsoft, and Nokia have been advancing the dialogue sparked at a Wilton Park event in June 2017 on “The Role of Digital Technology in Tackling Modern Slavery” to formally explore how technology could be better utilized in finding solutions to stop human trafficking and modern slavery. Today, the conversation has turned into action. Digital information and communication technology companies offer opportunities to create a step change in the effort to eradicate trafficking. In one recent example, a tech company was able to share and coordinate disparate satellite readings to track a rogue ship off the coast of Papua New Guinea carrying victims of forced labor, which, through collaboration with investigative journalists at the Associated Press, resulted in the liberation of 2,000 people. Tech Against Trafficking will build on and amplify the potential of some of these companies. In 2018, Tech Against Trafficking will focus on mapping and analyzing the landscape of existing tech-focused initiatives to tackle modern slavery. The key findings will be shared publicly by the end of the year and will help the group develop a three-year strategy. Cloud and mobile apps to allow first-line responders, the public, and vulnerable workers to raise awareness, access resources, and report concerns, among a wide variety of other solutions. 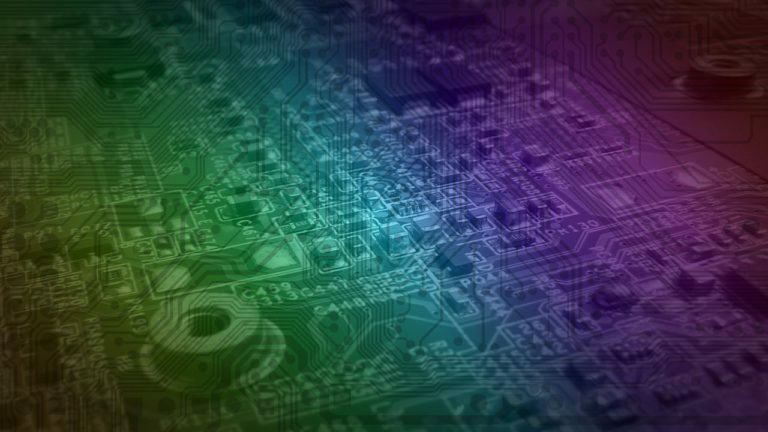 Basic hardware, such as laptops and smartphones to be made more easily available by technology providers to NGOs supporting vulnerable groups and victims. National helplines that raise awareness, support victims, and serve as hubs of data collection, analysis, and sharing to advance our understanding of and response to slavery. Data tools to deal with the problem of data overload that can disable effective responses and to identify connections in the data that would otherwise be missed (e.g. using AI and Big Data). Supply chain transparency tools to improve traceability and transparency of supply chain labor standards. Business for Social Responsibility (BSR) has been appointed secretariat of Tech Against Trafficking and will be supported by an Advisory Group of civil society organizations. The RESPECT Initiative, which is composed of Babson College’s Initiative on Human Trafficking and Modern Slavery, Global Initiative Against Transnational Organized Crime, and the International Organization for Migration, has been appointed as the research lead of Tech Against Trafficking. With leading technology companies combining their experience and expertise to focus on this issue, it’s an exciting time for the technology and human rights space. The more companies involved, the stronger this initiative and its impact will be. We invite all interested technology companies to contact us at livia.wagner@globalinitiative.net (Ms. Livia Wagner) now to find out how to get involved.